I am very sorry to say we have had to postpone the storytelling event this Thur, 2nd Dec – ‘Wayland Tales’ till after Christmas. The weather forecast for the night is too unpredictable to risk running it. We have a wonderful line-up of traditional tales from the Wayland area waiting for you, we will be advertising the new date as soon as we can. The Project Focus Group Meeting on Tuesday 30th Nov has been Cancelled. The Project Focus Group Meeting on Tuesday 30th Nov has been Cancelled due to the bad weather forecast for the night. There will be a history exhibition including the new illustrated Saham Time-Line and Local Crafts Fair at the Wells Cole Community Centre, Bell Lane, Saham Toney from 10am-4pm. Entry is free and refreshments will be served all day. 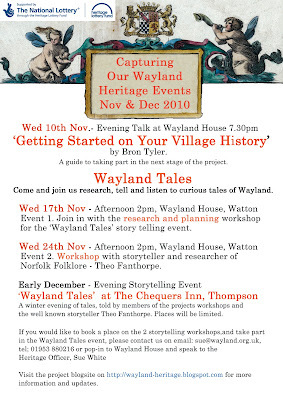 Come and join us research, tell and listen to curious tales of Wayland. 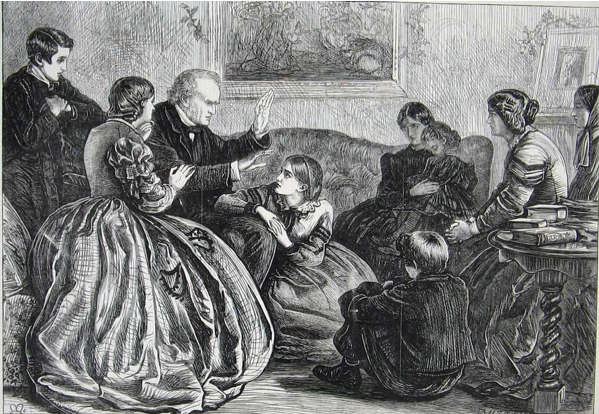 Bring your traditional local tales of all kinds and share them with others. As long as the stories are connected with the Wayland area they can range from tales of ghosts, legends, crime, funny events too tragedy. We are not looking for new short stories created by you, but versions of true events or tales that have been passed down the generations. Event 1. 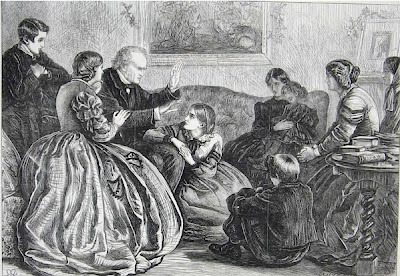 Join in with the research and planning workshop for the ‘Wayland Tales’ story telling event. Event 2. Workshop with storyteller and researcher of Norfolk Folklore - Theo Fanthorpe. 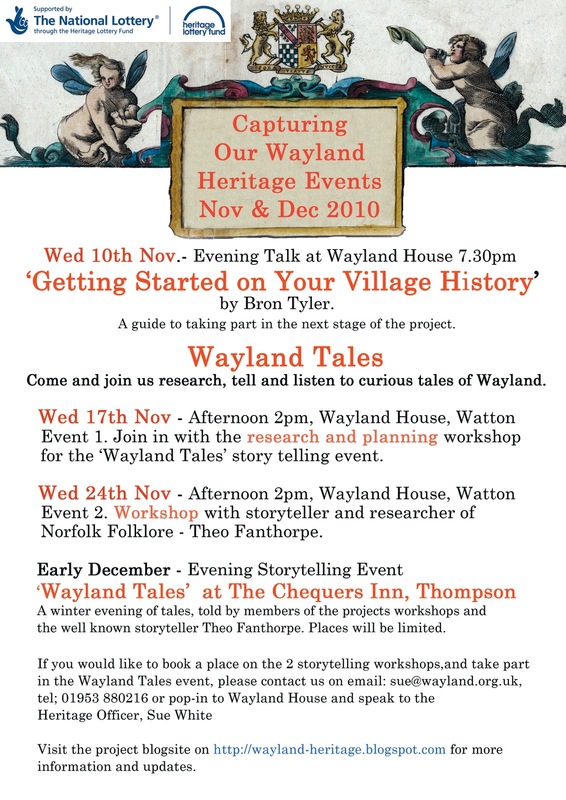 2nd December - Evening Storytelling Event ‘Wayland Tales’ at The Chequers Inn, Thompson. A winter evening of tales, told by members of the projects workshops and the well known storyteller - Theo Fanthorpe. Places will be limited to 25, you will need a ticket priority will be given to those who have been researching local tales and/or taking part in the workshops. The tales will be recorded at the event to form the base for a DVD that will be bound into an illustrated book of the 'Wayland Tales'. There will be also be 2 Writing Workshops to help with the production of tales for this 2nd book stage, on the evening of Tue 11th Jan and the afternoon of Wed 12th Jan, both at Wayland House, Watton. These workshops will also be useful for those involved in writing their 'Village History' with the project. If you would like to book a place on the above workshops, and take part in the Wayland Tales, please contact us saying which workshops you would like to attend email: sue@wayland.org.uk, tel; 01953 880216 or pop-in to Wayland House and speak to the Heritage Officer, Sue White. Following on from the project Focus Group meeting on 2nd Nov, we have taken the direction followed by the meeting to set out a framework for the next stage of the project. We are now looking for written submissions from project members for inclusion is a series of publications supported with multimedia DVD or CDs. Geology and Prehistory in brief of your parish. Origin of the village name. 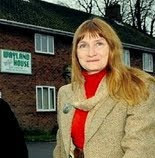 Bron’s Tyler's evening talk 'Getting Started on Your Village History' on Nov 10th 7.30pm Wayland House, Watton will provide guidance for those terrified at the prospect. We are here to give help and back up with sources of info etc, just ring or email. The above sections will need to be written by the end of Jan. There will be two writing workshops to help you on your way and give guidance on the evening of the 11th Jan 7-9pm and afternoon of the 12th Jan 2-4pm both at Wayland House, Watton, please email me to book a workshop place. Hope to see you on the 10th Nov as we feel this is an important chance to discuss any issues you may have. We are hoping that members of the Focus Group will have their first drafts of the 'Village Portraits' ready for the next meeting on 30th Nov.